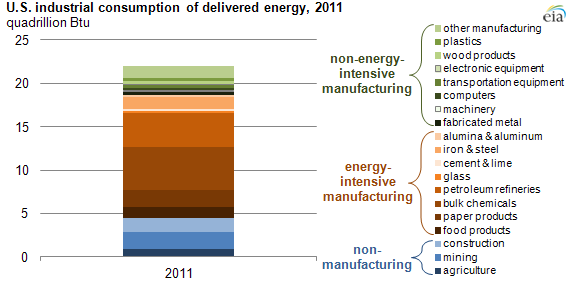 The U.S. industrial sector was responsible for more than 30% of total U.S. energy consumption in 2011. While the term "industrial sector" may sound remote to the general public, its impact on daily life is highlighted by the wide range of industrial activities represented by the products and equipment found at a local supermarket. 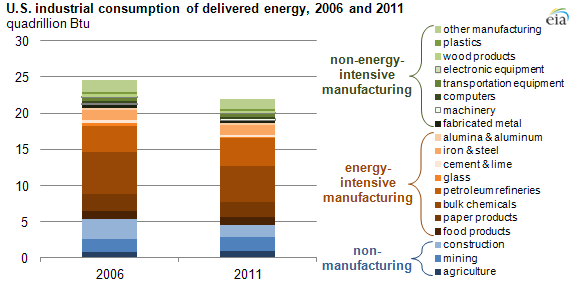 The chart above shows energy consumption for individual industries in 2011: non-energy-intensive manufacturing, energy-intensive manufacturing, and non-manufacturing. The agriculture industry is well represented in the produce, meat, and dairy sections of a supermarket. The food manufacturing industry and beverage industry, considered part of other manufacturing, are well represented throughout the store. In the nonfood aisle, motor oil, lubricants, and waxes are from the energy-intensive petroleum refining industry; soaps and detergents represent the bulk chemicals industry; and cloth kitchen items and small leather goods fall into other manufacturing. More representatives of energy-intensive industries are found in packaging: aluminum cans for soda, iron and steel for canned foods, paper for cereal boxes, glass for pickle jars, bulk chemicals for plastic milk jugs, and plastic packaging for cold cuts and frozen vegetables. The mining industry produces the raw materials for virgin glass and steel, and the petroleum refining, natural gas, and mining industries produce raw materials for bulk chemicals. In the supermarket's infrastructure, the cash registers and scanners represent the computer manufacturing industry, shelving and display cases represent the glass and fabricated metal industry. The electrical switches and thermostat in the HVAC (heating, ventilation, and air conditioning) system represent the electronic equipment industry. The floor waxers and the ovens used to bake bread represent machinery. The trucks that supply the supermarket represent the transportation equipment industry, and the pallets upon which many goods are shipped represent the wood products industry. The construction industry raised the building, and the concrete in the building and floor is a product of the cement and lime industry. The recent economic recession strongly affected the industrial sector, as seen in the chart below comparing 2006 data from EIA's Manufacturing Energy Consumption Survey (the last full calendar year before the recession) and the 2011 estimates used in EIA's Annual Energy Outlook 2012. Source: U.S. Energy Information Administration, Annual Energy Outlook 2012, derived from Manufacturing Energy Consumption Survey 2006. Source corrected from information in the September 25 post.